Gauhati University Recruitment 2018 July | Project Assistant Post :- Gauhati University has recently published a recruitment notification in the moth of July 2018. According to the latest Gauhati University Recruitment 2018 , applications are invited from eligible candidates for a post of Project Assistant in DBT funded project (Twining) entitled “Integrated approach to understand agarwood formation and value addition to agarwood (Aquilaria malaccensis)” in the Department of Bioengineering and Technology, GUIST, Gauhati University, Guwahati-781014 for a period of 3 (three) years or till completion of the project. 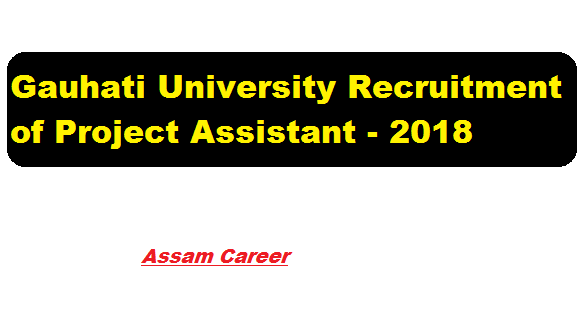 In this section, we will discuss in detail about Recruitment of project assistant Posts under Gauhati University Recruitment 2018 with all the details and requirement. Educational Qualifications: Candidates must pass M.Sc. in Biotechnology/Botany/Microbiology. Fellowship will be provided as per the DBT, Govt. of India norms. Interested Candidates may send application with complete biodata through email to Dr. Sofia Banu, Principal Investigator, Department of Bioengineering and Technology, GUIST, Gauhati University, Guwahati-14. Email id: sofiabanu2@gamil.com on or before 7 (seven) days of the publication of this advertisement. Only shortlisted candidates will be intimated for the interview. No TA/DA shall be paid for attending the same.